Why would someone choose to collect George III silver teapots and stands? Why that period, and why such a narrow focus? For us the answer is fairly straightforward. First relates to size. Silver teapots and stands are small so they are easily portable, and flexible to display. Having at various times collected 18th century American furniture, oriental rugs, and contemporary paintings, it became apparent that space is something that one must consider when collecting. Even with two houses, there is need for a relatively few pieces of furniture (e.g., highboys, secretaries, tables, etc), a limited amount of floor area for rugs, and modest wall space for hanging paintings. However, silver teapots and stands can easily be displayed in numerous places, such as on mantels, inside secretaries, on display shelves, or on top of a variety of furniture surfaces. Also, being small in size makes storing them easy – just tuck them inside a tarnish preventing cloth pouch and pack them away for the season. They are also relatively easy to ship. Being metal they are not prone to breakage and typically weigh less than two pounds so UPS or FedEx does not charge an arm and a leg to ship them internationally. This was very important since we knew we would likely be purchasing most pieces remotely and therefore logistic issues could be minimized. Second relates to authentication. English silver has rigorous hallmarking standards. Literally altering sterling silver hallmarks is viewed the same a counterfeiting, since for much of the 18th century silver was essentially viewed as currency in England. There are very good reference sources for the various hallmarks, which makes identifying an English silver piece pretty straightforward. Also, silver pieces photograph pretty well and a lot can be determined from a series of detailed picture (it seems that repairs and damage is accentuated in a photograph.) This again was important since we would be purchasing most of our pieces long distance. Lastly and most importantly, we found this period of English history to be extremely interesting. Our collecting focus is from 1780 to 1800, a span of only twenty years, but during this time England was undergoing major changes artistically, socially, and economically. But why pick teapots and stands? Tea has always been a central theme in English life and as such, the teapot to us seemed to be the perfect choice of an art form which would accurately reflect the changing tastes and styles of the period. Unlike the earlier George II period where teapots bases were typically of a pedestal design, during this period teapots typically had flat bottoms, which meant they could potentially scorch unprotected wood surfaces. This prompted the creation of teapot stands, or under trays, to protect the surface from heat. These stands were phased out in early 1800 with the growing use of serving trays. In our mind, a silver teapot neatly sitting atop a quaint little stand presents a charming picture of “tea time” from times past. George II design was what in America would be characterized as Queen Anne. Shape was a key factor in George II design -- flowing curves with an emphasis on form, which was reflected in both overall shape as well as carefully integrated chased surfaces. Silver teapot designs of this period revolved around a bulbous, bullet-shape body sitting on a pedestal base. As the George III period evolved, the style trended toward Regency, or what in America would be termed Federal, where forms were more rectilinear in profile and considerable emphasis was given to engraved rather than chased ornamentation. While engraving and final forming were still done by hand, machinery was becoming more prevalent in manufacturing, and many of the wares that previously were made completely by hand were now being made in quantity using a combination of machine and handwork. For example, roller mills were increasingly being used to flatten silver thus reducing the labor intensive hand hammering required to flatten a silver ingot into a workable sheet. Also, some larger shops, such as Hester Bateman’s, were using stamping machines to cut some of the delicate filigree work or to make a beaded edging for which her shop ultimately became well known. Fortunately Federal designs were easily adapted to accommodate evolving manufacturing technology. It has even been suggested that the workmen in Hester Bateman’s shop in the 1780s essentially assembled prefabricated "teapot kits". During this period the middle class in England was becoming more affluent and demand increased for affordable luxury items so they could display their increasing wealth. Fortunately costs were coming down with the introduction of new production methods and use of specialized craftsmen, so silver items (including teapots and stands) could be made more economically for a rapidly expanding customer base. However, what most impressed us about this period was the degree of teapot design innovation. 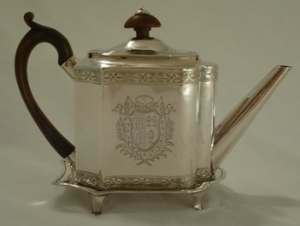 Unlike the earlier George II period where most teapots were of the Queen Anne bullet shape with often only the chasing or engraving distinguishing one from another, teapots made in the 1780s and 1790s ranged in style from simple oval shapes with minimal engraving to elaborate serpentine and batwing forms with extensive Federal-themed engravings. It seemed that craftsmen were able to spend less time hammering and chasing and more time creating innovative designs that would potentially entice a customer to purchase one of their pieces. It is this variety of new and interesting forms that most attracted us to this period. After 1800, designs increasing became less rectilinear and, in our eyes, less appealing. Like any collectors we had to start somewhere and our start happened to be on eBay. Our first purchase was a sterling tea service made by the Currie and Roby firm in New York around 1910. The set was in the George III style and in perfect (apparently unused) condition. After living with the set for a few months, we both decided that George III was our preference and made the plunge again on eBay and purchased our first period George III teapot and stand. It was made by Henry Chawner in 1792 and was in wonderful condition with a fantastic engraving of a family coat-of-arms (actually one family impaling another). As is often the case with first purchases, our emotion overruled our senses and we likely paid more than we should have. Nevertheless, it was the stimulus that got the ball rolling. What followed was an extensive period of study. 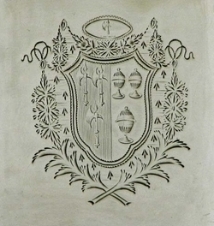 We spent untold hours searching out and recording examples of teapots and stands, which had been sold or were available (the internet is a great resource in this respect), as well as researching and learning the various aspects of heraldry so that family coats-of-arms and/or crests could potentially be identified. Quite often initial purchases turn out to be disappointing with additional learning and experience, however happily the enthusiasm for our initial Henry Chawner teapot and stand has not waned.